SNHR has taken it upon itself to record the bombardment incidents that constituted violations of the customary international law since the first day of the US-led intervention, September 23, 2014, which aimed to eliminate the terrorist group ISIS, as SNHR has built a dedicated database for all incidents, which we were able to document, including all details such as place and date, names, and pictures and videos whenever possible, as well as accounts from people who survived the bombardment or eyewitnesses, and pictures of destruction among other data through ongoing monitoring and documentation. The report, released by SNHR on the 4th anniversary of the beginning of the international coalition’s intervention in Syria, outlines the most notable attacks by international coalition forces since the start of the intervention in Syria and the violations that resulted from those attacks, including killing and forced displacement. change with respect to territories in east and northeast Syria, as ISIS’s areas of controls have largely diminished in light of the heavy airstrikes by international coalition forces, as well as the artillery and rocket shelling by the Syrian Democratic Forces (SDF), who are primarily composed of the Kurdish Democratic Union forces with the backing of international coalition forces. The report stresses that international coalition forces’ offensives resulted in violations of the international humanitarian law, which also reflected on the Syrian community in those areas, while shedding light on the implications that might result from the fact that an ethnicity-based force with foreign connections has control with regard to the stability and security of the Syrian community in the areas taken over by those forces in the wake of ISIS’s defeat. The report adds that defeating ISIS involved violations that civilians bore the brunt of, as buildings, shops, and infrastructures were destroyed to an immeasurable extent, while tens of thousands of civilian residents have been displaced. Defeating ISIS will bear no actual significance as long as the essential aspects of this victory aren’t fulfilled by compensating those victims who must be returned to their houses and truly be involved in governing their areas. The report sheds light on the unlawful attacks carried out by international coalition forces in Syria between September 23, 2017, and September 23, 2018, in addition to analyzing the data that contains violations perpetrated by international coalition forces which were documented by SNHR between September 23, 2014, and September 23, 2018. The report draws upon a number of accounts, as two accounts were included in the report. According to the report, the international coalition forces’ attacks during the first two years were more accurate and caused fewer civilian deaths, as they targeted mostly military facilities and armories belonging to ISIS compared to the last two years’ attacks which were more indiscriminate and saw a heavier use of artillery, as we monitored, where this weapon is known for having a lesser degree of accuracy. The report also records a limited use of white phosphorus munition in areas located far from frontlines. Further, the report notes that the last two years saw a more explicit and growing support for the Kurdish Democratic Union forces despite them perpetrating wide patterns of violations, some of which constitute war crimes, particularly the crime of forced displacement which were perpetrated on basis of ethnicity. 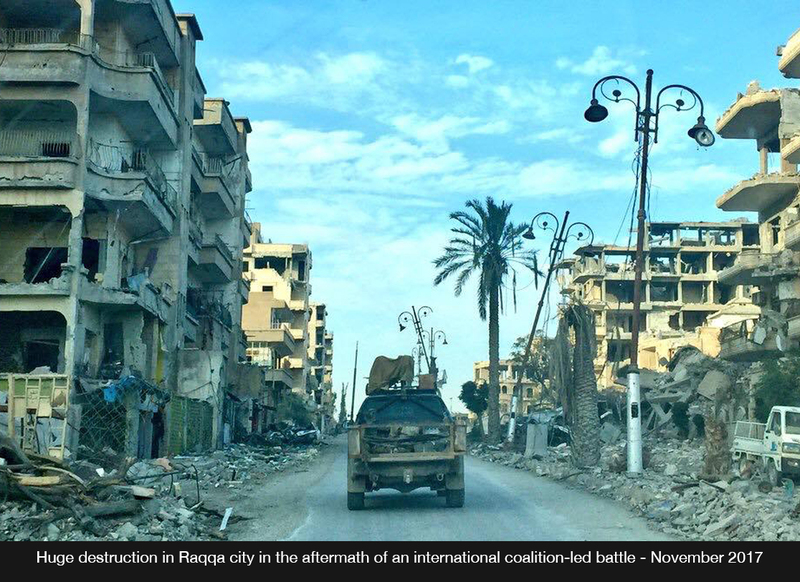 This support culminated during the battle for taking back Raqqa governorate. The report documents that 2,832 civilians were killed at the hands of international coalition forces from the start of their military intervention in Syria until September 23, 2018, including 861 children and 617 women. In addition, the report outlines a distribution for the death till by year, as the third and fourth year saw the greatest portion of deaths. On the other hand, Raqqa saw the most deaths, followed by Aleppo and Deir Ez-Zour governorates. According to the report, international coalition forces killed 976 civilians, including 194 children and 294 women, during President Barrack Obama’s term, while 1,856 civilians, including 667 children and 323 women, were killed during President Donald Trump’s term. The report also documents 156 massacres perpetrated by international coalition forces, and no less than 170 attacks on vital civilian facilities, including 25 attacks on schools, 15 attacks on medical facilities, and four attacks on markets between the start of the military intervention in Syria and September 23, 2018. Moreover, the report stresses that offensives in the governorates of Raqqa, Deir Ez-Zour, and Hasaka resulted in the displacement of no less than 550,000 people, an outcome for which both international coalition forces and SDF were responsible, as well as ISIS who used them as human shields. The report records that 432 civilians, including 103 children and 131 women, were killed by international coalition forces between September 23, 2017, and September 23, 2018. In addition, international coalition forces were responsible for no less than 27 massacres in the same period of time, as well as 12 attacks on vital civilian facilities at least, including four attacks on medical facilities, two attacks on schools, and one attack on a market. The report notes that international coalition forces acknowledged that 100 attacks resulted in civilian deaths, including 23 attacks that resulted in massacres (five victims killed in the same place at the same time), compared to the 156 massacres documented by SNHR’s report to a difference of 133 massacres. The report stresses that the indiscriminate and disproportionate bombardments carried out by international coalition forces constitute explicit violations of the international humanitarian law. Also, the crimes of indiscriminate murder qualify as war crimes. In addition, the bombardments have resulted in collateral damages that involved civilian deaths, injuries, or significant damages to civilian objects. There are strong indicators that compel to believe that the damage was too excessive in relation to the anticipated military advantage. The report calls on the international coalition command to support the team working on investigating and following with incidents with more manpower, raise and dedicate more efforts and capabilities in this regard, draw out a data map showing the most affected areas from aerial attacks, and push towards starting to address the economic and moral ramifications resulting from those attacks. The report stresses that the military victory over ISIS should be built upon. Also, the report calls on the international coalition command to rid the remaining areas of their effects, seriously work on establishing a democratic community leadership which involves the residents of those areas, work seriously on providing means of a decent life for the forcibly displaced in displacement camps, hold everyone who was convicted, through investigations, of being implicated in attacks that resulted in massacres against civilians and discharge them. Also, the report calls on the International coalition command to assist the Syrian community in eliminating terrorist groups, akin to ISIS, such as the terrorist group supported by the Islamic Republic of Iran which have already started establishing bases in Aleppo and Damascus suburbs. Lastly, the report calls on the OHCHR to address the issue of the forcibly-displaced in the SDF-held areas and issue a report on the violations they are experiencing while also touching upon the fallouts of the bombardment by international coalition forces on those areas.